So tell me, dear reader – do you think Rosé is for summer, or is it a year-around wine? 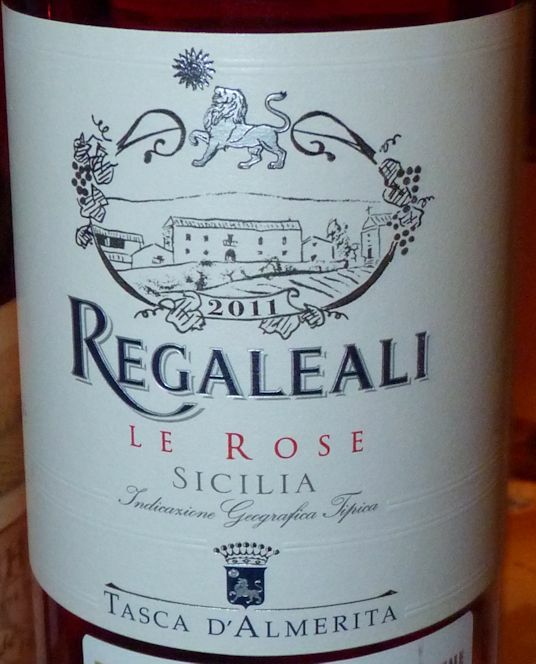 In January, when it is –10 outside, would you still reach for Rosè to drink with your dinner? No, you only need heavy reds, you say? But why? Your dinner menu doesn’t consist of 5 variations of the hearty beef stew, and so the wines you drink shouldn’t be just Cabernet Sauvignon from 5 different glasses. Well, I think the real picture is not as bad as I’m hinting above. The same way as now literally every winery in the world added Rosé to their repertoire, wine drinkers developed better appreciation for Rosé, its light and playful character, and ability to complement wide variety of dishes. And which region makes the most versatile Rosé? Provence, of course! Yes, Rosé is made everywhere nowadays, but when it comes to finesse and character, Provence Rosé is hard to beat. 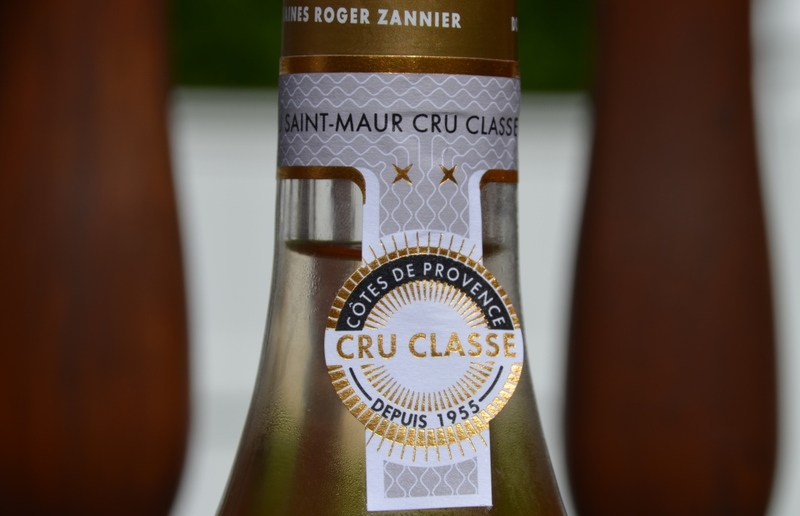 I recently had an opportunity to taste the line of Rosé wines from Domains Roger Zannier, and it happened to be a great lesson in diversity of Provence Rosé. Domains Roger Zannier Rosé line up consisted of three different wine, each one having its own unique personality. 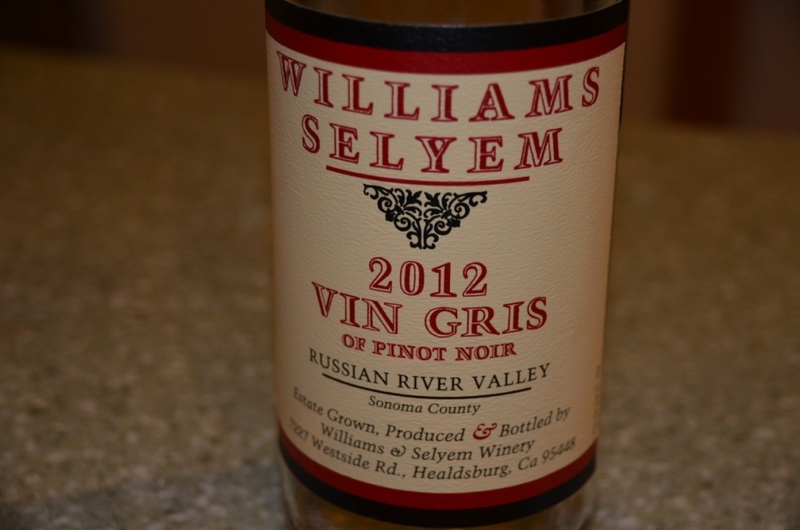 In a blind tasting I would never tell that the wines were made by the same producer. 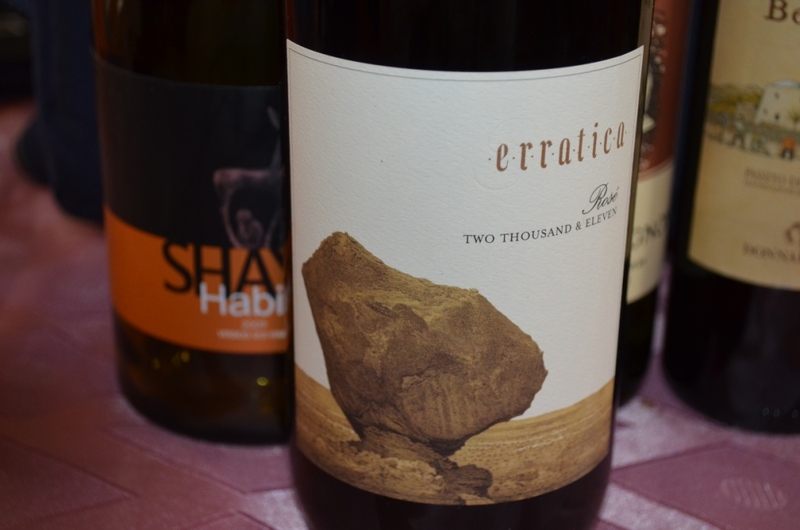 And the main quality – while extremely quaffable, these wines offer food for thoughts, they are asking you to focus and to figure out what you taste. V: 8, different and intriguing. Try it for yourself. Three wines, three unique and different taste profiles. And an important message – first of all, these are excellent, versatile wines. And then yes, they are pink (or mostly pink) in color. Don’t let Rosé to hibernate away from your dinner table during fall and winter – no matter what temperature is outside, there is always place for a little Rosé in your glass. Cheers! What do you think we will be talking about today? Typically the “pink glasses” is just an expression, an allegory; we use it to say that all is good in the world. But sometimes those allegories can materialize, for instance, in the form of Rosé tasting. Rosé is Rosé is Rosé. Rosé wines became extremely popular over the last 3–4 years. Nowadays, almost every winery I know of added at least one Rosé to their repertoire, if anything, to be available at least in the tasting room. But then there are those who started it all, for whom Rosé is a way of life and not just following the fashion and consumer demand. I’m sure that by now you figured that I’m talking about Rosé wines from Provence in France. The Provence wine tasting I attended a few weeks more than two month ago was dedicated to all of the wines made in Provence, not just Rosé. However, if we will look at the stats of wine production in Provence, 89% of those wines are Rosé, 7.5% are red, and 3.5% are white, so it is no wonder that Provence is typically associated with Rosé. Total wine production in Provence in 2014 was about 177 million bottles. To give you more numbers, there are about 600 producers and 40 negociants in Provence. Overall, 9% of the wines produced in the world are Rosé, with the general trend of producing drier wines (particularly Provence Rosé has less than 4g of residual sugar per liter of wine). Provence is the largest region in the world dedicated to production of the Rosé wines. Also, France is the biggest producer and consumer of the Rosé wines, and U.S. is the biggest consumer of Rosé outside of France. 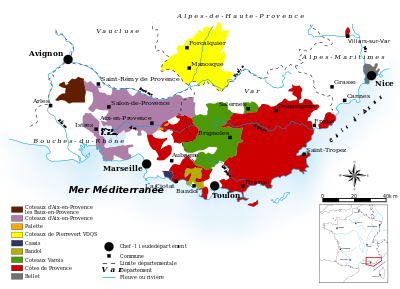 Provence was a cradle of winemaking in France, starting from the 600 B.C. in the area around Marseille. 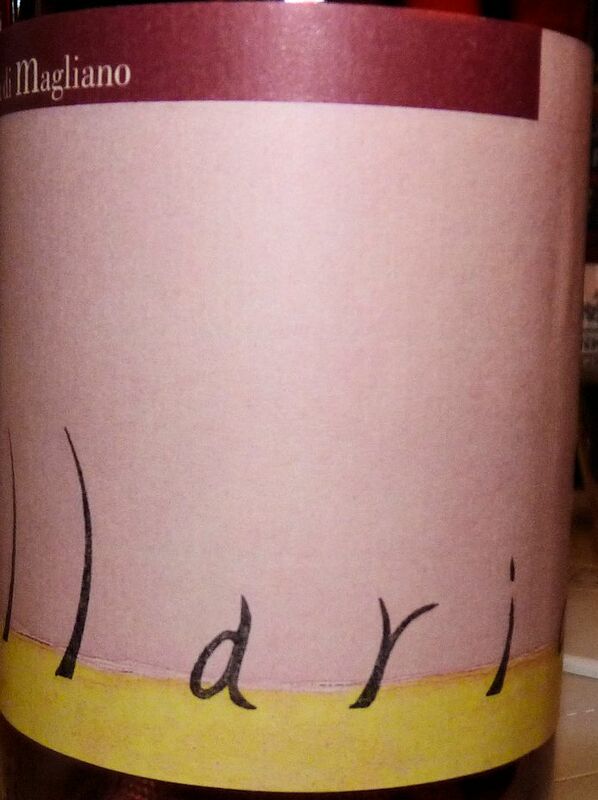 It is easy to understand why the wines were “rosé” in its style – maceration in contact with skin was simply not used, so the wine was produced from the juice which the grapes were “bleeding” after harvest, which would have a pinkish color. Today, the Rosé is produced in the very similar way as for the thousands of years, allowing only brief period of the skin contact. 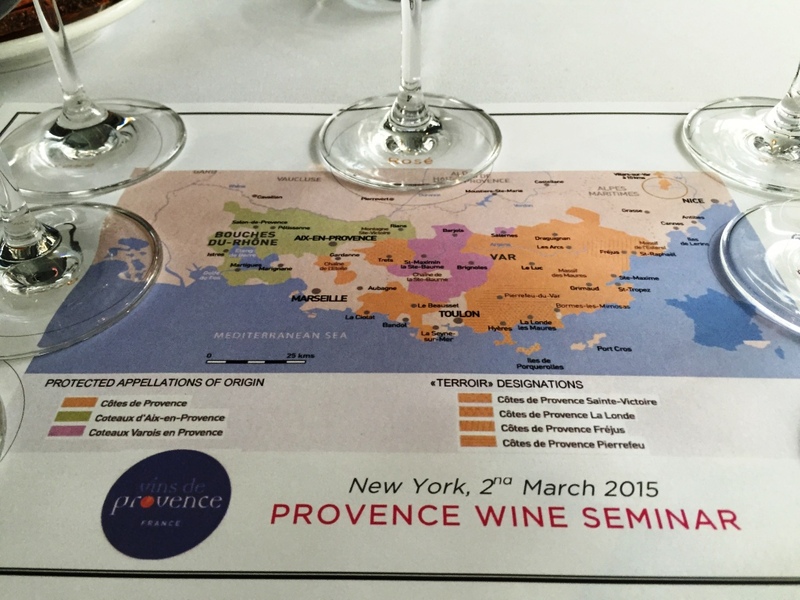 Most of the Provence Rosé are produced from Grenache, Cinsault, Mourvèdre, Tibouren, Carignan and Cabernet Sauvignon. Now, let’s talk about the seminar and tasting. In the seminar, we tasted 5 different Rosé wines from the different sub-appellations, as well as two reds. To be entirely honest, I didn’t find the dramatic differences between the wines from the different appellations – they were all Rosé wines, and I liked most of them (I’m a sucker for a good Rosé). 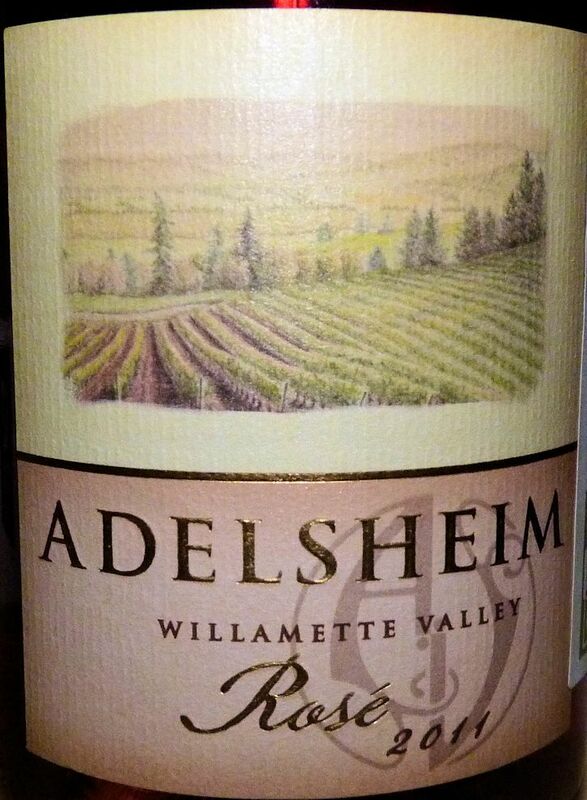 P: Dry, intense acidity, very clean, beautiful fruit, perfect balance. The tasting consisted of 65 different wines, out of which one was white, 7 were red, the the rest (57) were Rosé. What I really liked about this tasting was a very unique format. Nobody was pouring the wines for you. All the wines were standing on the tables in the middle of the room, each wine having a sticker with the number on it. All the numbers were corresponding to the wine descriptions in the tasting booklet. Everybody were walking around and pouring the wines for themselves. The winery representative were all on hand, available to answer any questions. However, because of self pour, there was no need to wait for anyone to pour the wine for you, no need to stand there for 2 minutes, patiently waiting until the person pouring wine would finally notice you – here you could go at your own pace, and it was really convenient. I like this system a lot more than a traditional tasting. 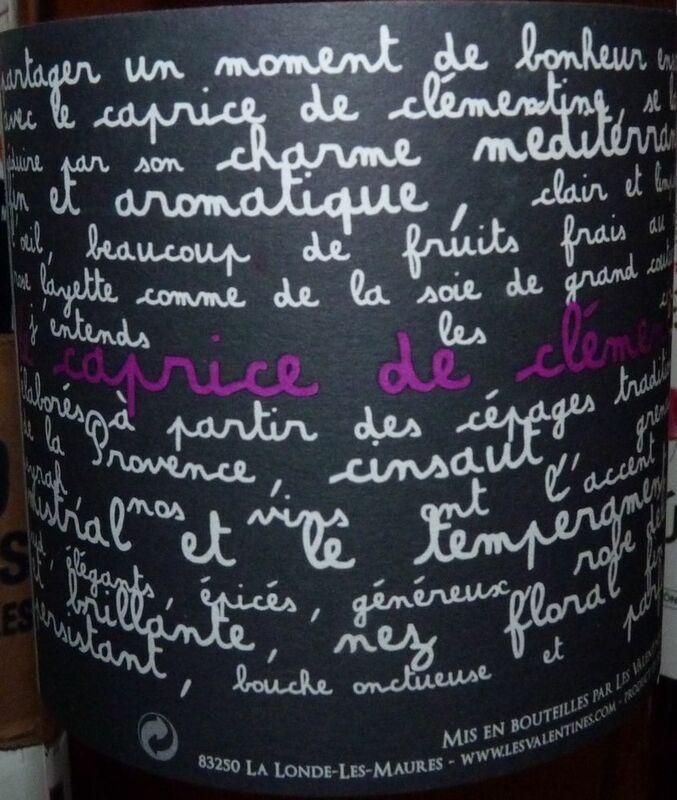 2014 Château Les Valentines Le Caprice de Clémentine (SRP $18, Grenache, Cinsault) – +++1/2, excellent! 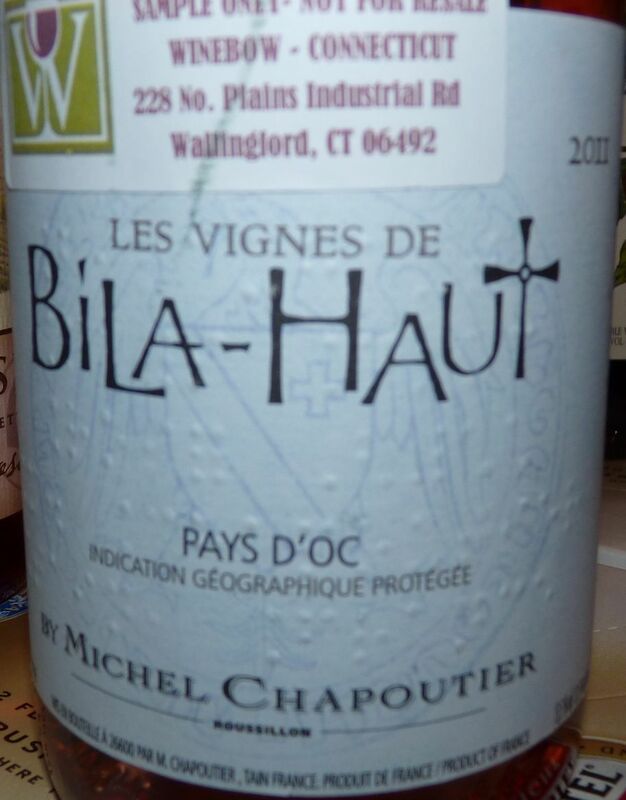 2014 Château de Pampelonne Maitres Vignerons de Saint Tropez (SRP $20, Grenache, Cinsault, Syrah, Tibouren) – +++, excellent! 2012 Château Réal d’Or (Cabernet Sauvignon, Grenache, Syrah) – +++, perfect Cab! 2013 Domaine Clos de L’ours Grizzly Red Côtes de Provence (Syrah, Grenache, Mourvedre) – +++, yummy, open, pepper! All in all, this was an excellent tasting. I don’t know if there is ever a bad year in Provence, but I definitely liked lots of 2014 Rosé, and I think you will too. Also, if you will have an opportunity to try a Provence Red – don’t miss it, those wines are definitely worth your attention. Happy Provence Rosé (and red) hunting! Cheers! Rosé – Still Misunderstood and Looking for Love? 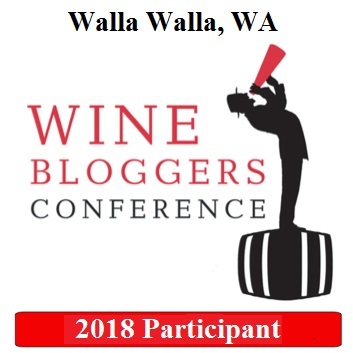 This Wednesday, August 14th, is the Wine Blogging Wednesday event, where all wine bloggers get the chance to share their thoughts and experiences related to the designated theme. 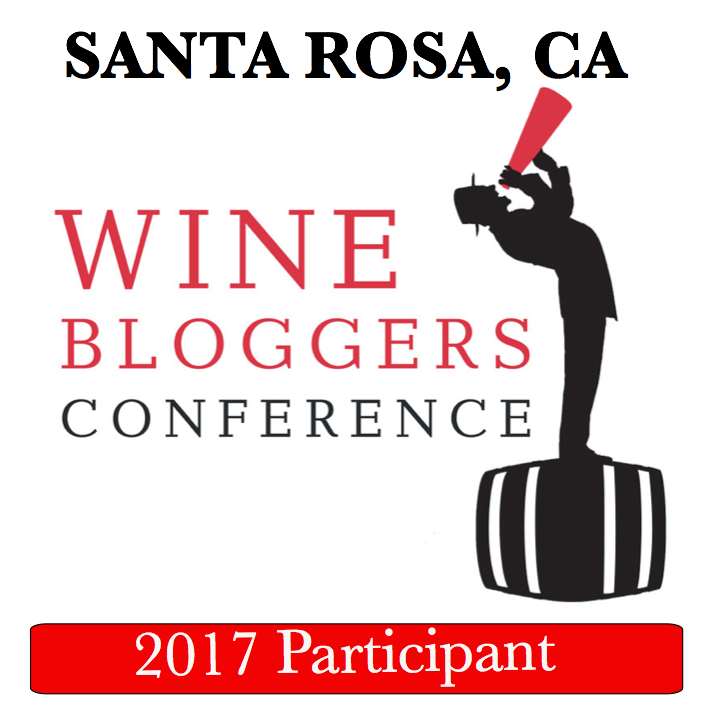 The theme of this upcoming Wine Blogging Wednesday event, or WBW for short, is Rosé – here are the details of the announcement. This is what this blog post is all about. How often do you drink Rosé? Do you think Rosé is fully understood and appreciated by the consumers en mass? I’m afraid that many wine drinkers still have a notion that Rosé is either sweet, or strictly seasonal, or mostly inferior, or all of the above. I remember being in France about 7 years ago, in November, and ordering a bottle of Tavel in a restaurant. My French colleague gave me a look, and then said sternly “just keep in mind, you are ordering a summer wine” – of course he has an excuse as a Burgundy buff, but still – even in France, people often see Rosé as seasonal wine, not as a wine you can drink all the year around. In the US, yo would rarely find Rosé on the main shelves – they are usually setup on a side, ready to be replaced by the holiday wines, and slowly moving to the “closeout bins” as summer comes to an end. Many people judge Rosé by the color, which reminds them of White Zinfandel, and think it is a sweet wine. I have seen many people come to taste the wines at the store and refuse the glass of Rosé simply saying “no, thank you, I don’t drink sweet wines”. It really takes time to convince them that the wine they are refusing is actually perfectly dry, refreshing and food friendly – and not only during summer, but all year around. Having presented this pinkish “doom and gloom” to you, I actually have to admit (happily) that over the past 3-4 years, the situation is changing to the better. 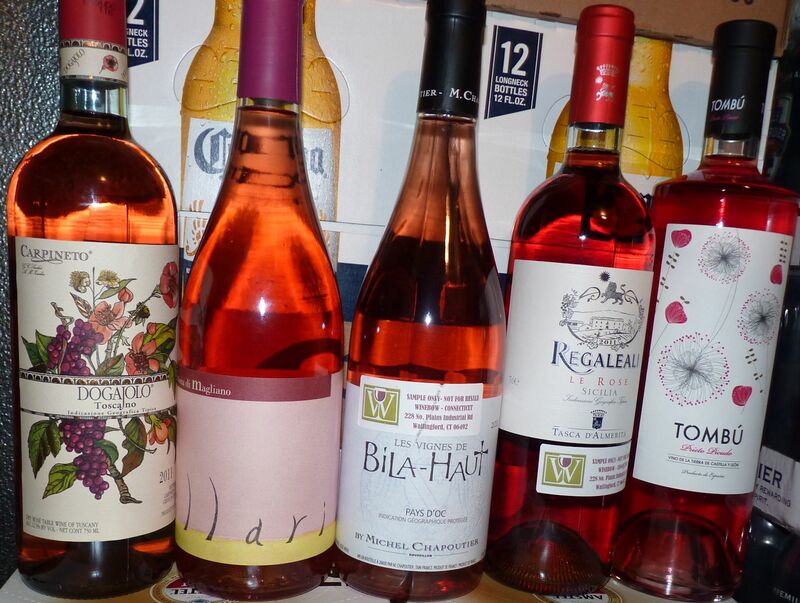 Even as a seasonal wine, there is really an abundance of Rosé offered in the wine stores. More and more wineries and winemakers now include Rosé as part of their standard offering, year in, year out. This happens in France, this happens in Georgia, this happens in California, Greece, Italy, Spain, New York and many other places. The great thing about Rosé is that they are some of the easiest wines to drink – and some of the food-friendliest. Rosé typically has a flavor profile of a light red wine, with strawberries, cranberries and onion peel being some of the main characteristics – it also lacks the punch of tannins as skin, seeds and stems contact is minimized during the winemaking. At the same time, Rosé typically has savory complexity coupled with acidity which is usually a bit less than the acidity of a dry white wine. Overall, it is easy to drink and food friendly – what else do you need from wine? Of course I’m not advocating that the whole world should start drinking only Rosé at this point – but Rosé definitely has its own permanent (not seasonal!) place on the shelves of the wine stores and in your wine cellars. Let me now give you two great examples of Rosé wines. There you have it, my friends. Open a bottle of your favorite Rosé, pour a glass and enjoy – however remember – sometimes Rosé is too easy to drink… Oops, did we just finished this bottle? Cheers!